Listening to music in a vehicle is a favorite pastime for many people. However, the majority of stock stereos don’t have very good sound quality (especially the lower ends). To fix this problem, the best thing to do is get a subwoofer. Not only do you get a powerful bass performance, but you also help decrease the stress put on the small front and rear speakers. This will give them a better, more clear, and louder sound. The issue with subwoofers is that they can account for a lot of room in a vehicle. It’s not to best thing to have if you want to maintain your vehicle’s comfort and utility intact. That’s why the Stealthbox by JL Audio was invented. The Stealthbox delivers a superb level of sub-bass performance while taking up a minimal amount of space. The engineers at JL Audio begin the design process of the Stealthbox by examining the acoustics of the target vehicle and evaluating possible installation locations. It takes many hours of testing to perfect performance while minimizing the loss of vehicle utility and comfort. Then they choose from a huge variety of acclaimed subwoofer components and loading techniques to produce the best possible subwoofer experience for each specific vehicle. Prototypes are tested and fine-tuned to guarantee the best possible sound quality, output, cosmetics and fit. After a a couple months of very in-depth research, a the Stealthbox subwoofer is ready to be produced. Interested in a Stealthbox & Stealthbox Installation Services? 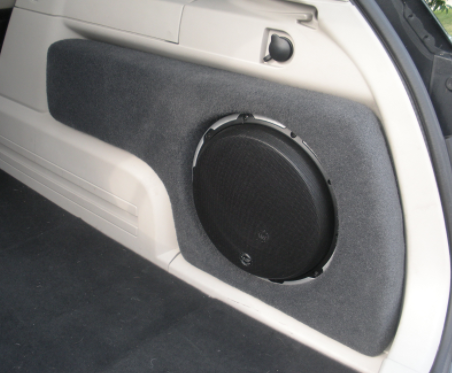 AutoWorks is an automotive shop that also offers & installs Stealthbox subwoofers as well as other auto audio products to towns in the Monmouth County area. Service towns include: Middletown, Tinton Falls, Oceanport, Keyport, Keansburg, Highlands, Matawan, Long Branch, Hazlet, Atlantic Highlands, Aberdeen, Shrewsbury Twp, and many more. To learn more about our products and installation services, contact us today at 732-671-0225 or visit the website. Many car owners enjoy listening to music in their vehicle. Unfortunately, most standard car stereos have poor sound quality, especially the lower ends. The best way to take care of this issue is to add a subwoofer. Not only do you get the benefit of the subwoofer’s powerful bass performance, but you also help reduce the stress put on the small front and rear speakers. This gives them a better, cleaner and louder sound. The only problem with subwoofers is that they usually take up a lot of space in the car. This can be a big issue if you want to keep your vehicle’s comfort and utility intact. This is where the Stealthbox by JL Audio comes into play. The Stealthbox delivers a superior level of sub-bass performance while taking up a minimal amount of space. JL Audio’s engineers start the design process of the Stealthbox by examining the acoustics of the target vehicle and evaluating potential installation locations. Many hours of testing take place to perfect performance while minimizing the loss of vehicle utility and comfort. Then they choose from a huge variety of acclaimed subwoofer components and bag of loading techniques to produce the best possible subwoofer response for every vehicle. Prototypes are tested and fine-tuned to guarantee the best possible sound quality, output, cosmetics and fit. After a a couple months of extensive research, a the Stealthbox subwoofer is ready to be produced. Looking for a Stealthbox & Stealthbox Installation Services?